Requests for every substitution of participants for the Conference must be made in writing by email to the Organiser at registration@singlivecourse.com by 28 December 2018. After this date, no such requests will be allowed. Requests for cancellation must be made in writing by email to the Organiser at registration@singlivecourse.com by 28 December 2018. The cancellation will not be effective until a written acknowledgement from the Organiser is received. 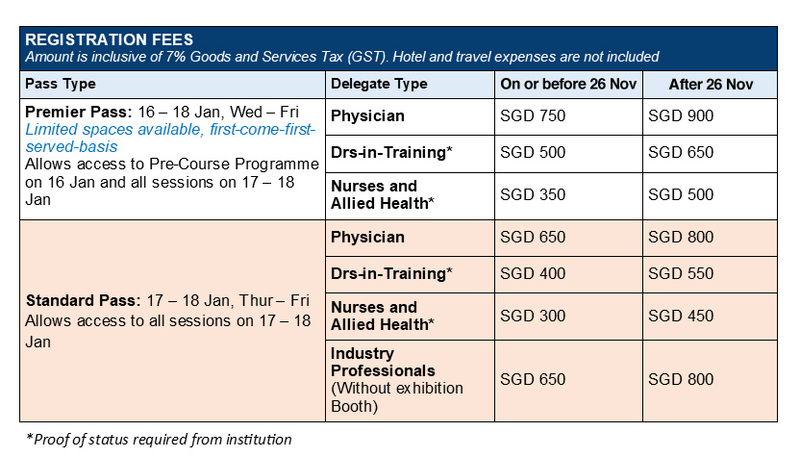 Registration fees may be refunded as follows: (i) written cancellation received by the Organiser on or before 28 December 2018 – 50% of the registration fee will be refunded; and (ii) written cancellation received by the Organiser after 28 December 2018 – no refund. The date of receipt by the Organiser of the cancellation email will be the basis for considering refunds. Refunds will be made as soon as reasonably possible after the Conference. No refunds will be granted if a participant fails to attend the Conference or only attends part of the Conference, or in case of cancellation of speakers, lack of space at the Conference venue or any other incidences during the Conference which are beyond the reasonable control of the Organiser. Individual participants requiring an official letter of invitation from the Organiser may request for one by contacting the Secretariat at registration@singlivecourse.com. The letter of invitation is not a commitment from the Organiser to provide any kind of financial support or travel arrangement, nor does it guarantee that an entry visa will be issued by the Singapore authorities to the participant. It is the sole responsibility of the participant to ensure all applicable visa and other immigration requirements are met. All expenses in relation to the Conference, registration for the Conference and attendance at the Conference are the sole responsibility of the participant. As the Organiser will require at least 2 – 3 weeks to process each such request, a participant is encouraged to apply at least 2 months in advance should he require a letter of invitation. The Organiser reserves the right at its sole discretion to decline to issue a letter of invitation to any participant without any reason or explanation. The participant consents to his photo/video being taken during the Conference for use in post-event publicity materials (including online and social media) by the Organiser. The participant agrees for the information submitted in this registration to be used by the Organiser in accordance with and to the fullest extent permitted by prevailing law and such policies the Organiser may have at the prevailing time. The participant consents to the collection, use and disclosure of his data by the Organiser in accordance with the PDPA and the data protection policy found here www.singhealth.com.sg/pdpa/. The participant agrees to the Organiser sending him information and/or contacting him via text message, voice calls, electronic mail or other means which the Organiser may deem appropriate on its continuing medical education programmes and/or events, healthcare educational events and other related topics and events. The participant confirms and agree that the consents granted herein do not supercede or replace any other consents which the participant may have previously provided to the Organiser in respect of the participant’s personal data and are additional to any rights which the Organiser may have at law to collect, use or disclose the participant’s personal data.